Did Gaga Get It Right? Let me get this out of the way; I am a Lady Gaga fan. For various reasons that will have to wait for another blog post, I like her and her music (well, most of it). But, I will be the first to admit that I am far too terrified to ever copy her outfits. Whether you think she ahs style or not, she is definitely in a class of her own. And then I saw the video for Judas, which dropped earlier than expected due to an unexpected leak. And she looks fabulous! 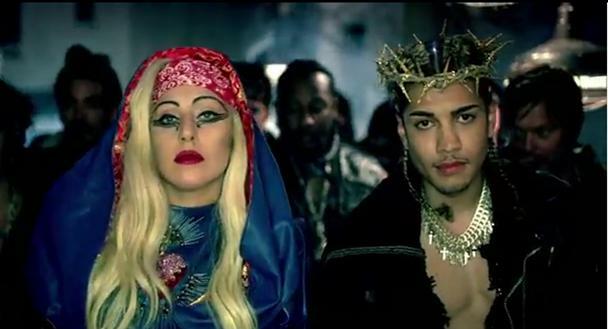 The music video for Born This Way (however much I may adore the song) freaked me out… but Judas is something else entirely. Her jewels here are stunning, and the gold looks classy when paired with her regal purple in this outfit. I love her make-up here too, and I think it suits her without being too outlandish. Plus Jesus is totally hot. She has taken her make-up up a notch here, and the pronounced flicks really appeal to me; it’s rare that you see Gaga channel pretty, but this look shows that she can be fierce and girly at the same time. Her nails here are absolutely fantastic. The whole look brings to mind Renaissance France/Italy and the decadent eyes, plum lips, and fabulous hair all channel royalty; you can just imagine her walking through the gardens in the Palace of Versailles. Just stunning. The blue here points to Magdalene’s characteristic blue gown in Da Vinci’s The Last Supper. She has swapped her biker outfit for one with Biblical connoations, and manages to look anything but saintly. She pulls the red lipstick look off very well, especially as she is actually supposed to look like an ex-prostitute here. And then it’s back to the Gaga we know and love. As the video takes a turn for the confusing, she adds some more Gaga-esque outfits that will either lead you to applause or bafflement. The skunk-hair made this my least favourite outfit form the video, and I actually founf the stoning scene quite shocking, if only becuase she lulled me into a false sense of security and I wasn’t expecting it. I did, however, love the mermaid outfit, as it was the one that was most charcteristic of Gaga’s theatrical style, and yet somehow looked stunning. Spot on with her leather theme, yet somehow out of a fairy-tale, and, perhaps most importantly for a woman who has permeated all aspects of society, quintessentially Lady Gaga.